We are sorry to see Clarify go, but after Feb. 17th, 2018 new licenses for Clarify will no longer be available for sale. You need to communicate clearly and quickly. But creating screen recordings and messing with formatting in Word can be time consuming and frustrating. That is why we created Clarify 2 - so that you could create better visual communications faster. See what's new by clicking here. Upgrade to Clarify 2 by clicking here. 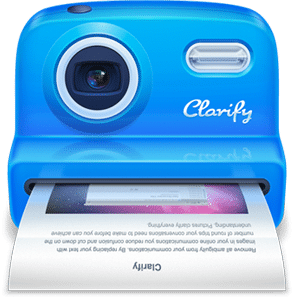 We won't hold that against you - you can purchase the latest version of Clarify 2 by clicking here. "Thank you for making one of the simplest, easiest, and most powerful software packages I have ever used that is tailor-made for its purpose and fulfills its purpose perfectly. "I was quickly able to figure out how to navigate, add steps, resize images, crop images, add annotations...everything I wanted in a tutorial builder. "I'm in the middle of building a process manual for my company as we switch to new software in a couple of weeks, and Clarify has made the experience actually enjoyable. "The app is genius! Just created an instructional document that would have been 6 paragraphs of exposition otherwise. Thank you!" Macworld4 out of 5 mice! Clarify takes the fastest, most direct path to getting information out of your head and into your customer's or co-worker's hands. 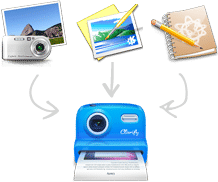 Share your document as a PDF file, email, or on the web via Dropbox or our free Clarify-it.com image sharing service. Answering a co-worker’s question or explaining something to a customer is simple. Take as many screenshots as you need so there is never any confusion. Preparing standard operating procedures for employees and contractors is simple. Use a screenshot to explain each step so they will never be lost. Quickly assemble, edit and prepare screenshots for presentations or screen casts. Telling a story with screenshots is way more powerful than just text.